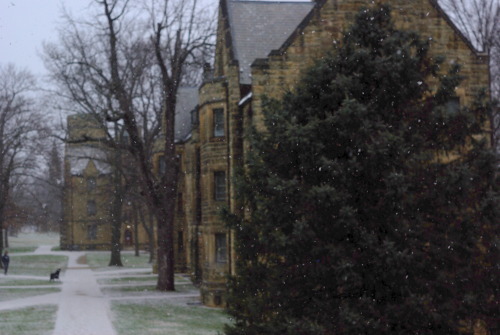 Kenyon's Winter Migratory Patterns; or, Where Did Everyone Go? The population of Kenyon College is smaller than my high school, and my high school was not enormous. One assumes that everyone knows everyone else here, and while it's certainly true that reputations are large and faces are usually familiar, for some reason, I don't seem to know ANYONE around me this semester. Who are these people?? Where are my friends?? Hypothesis 1: It's COLD. I can't make it from South Campus to North campus in one trip. I adapt by stopping into the dining hall or library to thaw my face and hands at the convenient half-way point, but if I don't have to go out, you really can't make me. Everyone else is probably hunkered down for hibernation as well. Hypothesis 2: It's the STUDY ABROAD SHUFFLE. Half the junior class has peaced out to sunnier climes, and the other half has returned from the exotic far-off and are stumbling around campus with the gobsmacked look of the culturally shocked. (Classes? Homework? What are those?) You hear things like, "This one time in Ghana," and "That reminds me of when I was in Belize," and "Hm, I do believe my malaria is flaring up again." Hypothesis 3: I have ventured BEYOND MY TERRITORY. Having finished all my graduation requirements and my anthropology senior exercises, I can now fritter away my last semester on FUN classes. So, of course, I sign up for Intro to Macroeconomics and Global Environmental Politics… These people act like they've never seen an anthropology major before, and in turn, I realize that there is a world beyond the crew that shows up to my usual class choices, like Anthropology of Food. Hypothesis 4: Everyone is HANGING OUT WITHOUT ME.